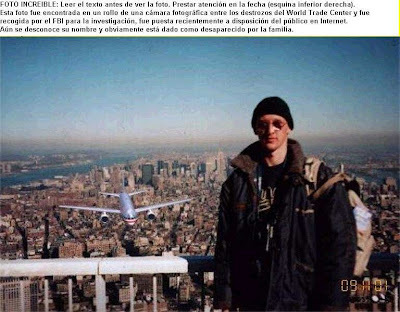 "One of the most famous Internet hoaxes in history is a photograph of a tourist standing on the World Trade Center observation deck with a plane appearing right behind him. E-mails claim the photo, which circulated in the days after the Sept. 11 attacks, was taken from a camera found in the rubble of the twin towers - though several features in the photo, including the direction the plane is travelling in, don't make sense. As it turns out, the edited photograph was created as a joke by a man in Hungary who sent it to a few friends, not realizing how quickly it would spread across the globe." Y tan increíble. Cuidadín con Internet que circulan demasiadas bromas que no siempre se entienden. Desde aquí recomendamos un estudio sobre el monóxido de dihidrógeno que ha sido recientemente publicado, pero del que los medios de comunicación, nos tememos que por oscuras razones, no han querido dar noticia.